During my conversation with Daniel Dean from Titan Games and Comics in Smyrna, Georgia, about what comic we should talk about this week, he got an almost painful look on his face. Not one to be insensitive, I asked if he was all right. Dean smiled and said, "Yeah, there are a lot of books coming out this week that I am excited about, but for one reason or another they're hard to recommend to new readers. "There are storylines wrapping up this week and other comics transitioning into new stories. There are even some amazing reprints coming out this week. So, I had a bit of a quandary until I remembered Tony Lee had 'Danger Academy' an OGN (original graphic novel, a usually-independent long-form comic book published straight to trade paperback) coming out this week and that's really my job done for me." Okay, so I asked why I should get this book. 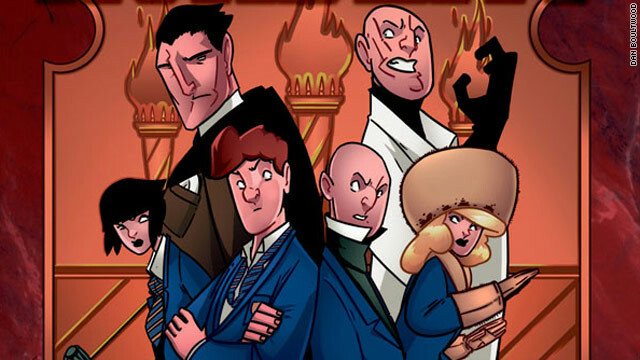 "His new book, out this week for $9 from Kickstart Comics, concerns a private boarding school for the offspring of Britain's greatest super-spies. There have been a spate of stories lately concerning watching the next generation of heroes learn the ropes, mostly coming from a superhero or sci-fi direction. This one is from a decidedly more 'Bourne Identity' direction and I have every faith in the book." We both agree that Lee's style of writing is very direct about very twisted plots and logic, a tack which has served him well writing "Doctor Who." One hopes readers show up for his dabbling in the backyard of Britain's other great cultural export: no, not Shakespeare, we mean 007. Although James Bond movies could have used more people being pursued by bears. Here are some of the comics scheduled to hit the shelves on December 28, 2011. Your local retailer will probably have these and others, so make sure to check with them for more details. Keep in mind folks that because of the holidays this week some shops won't be getting your new books until Thursday the 29th so call ahead if you're not sure. I have read a few excellent stuff here. Definitely price bookmarking for revisiting. I wonder how so much attempt you put to create one of these fantastic informative web site.